On October 22, 1900, Edmond Rostand’s play L’Aiglon (1900) opened at the Knickerbocker Theater in New York with famed stage actress Maude Adams (1872–1953) in the lead role as Napoleon Bonaparte’s son, the Duke of Reichstadt (1811–1832).1 American artist John White Alexander (1856–1915) commemorated her gender-bending performance in a full-length depiction (fig. 1), one of several theatrical portraits painted over the course of his career.2 Miss Maude Adams, as “L’Aiglon” is now held in a collection that I oversee at the Utah Museum of Fine Arts, University of Utah. 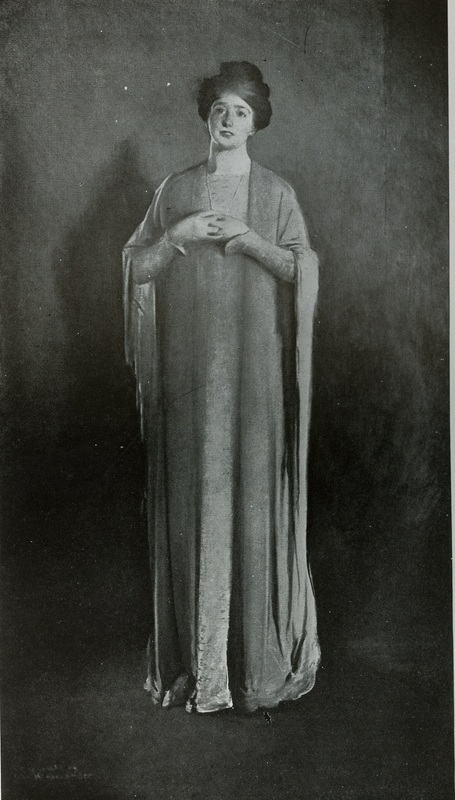 Previously, scholars believed that the artist executed the painting following the supposed first meeting of Adams and Alexander at Alexander’s summer residence at Onteora, New York, in 1905, several years after the Broadway debut of the play.3 However, while organizing the 2017 permanent collection reinstallation at the museum, Mythmaking and Truth-Telling: American and Regional Art, I made discoveries in the artist’s papers at the Archives of American Art that allow us to precisely date Miss Maude Adams, as “L’Aiglon” and to better contextualize the painting within the intellectual milieu of its creation. Between submission and publication of this article, Mary Anne Goley’s long-awaited book devoted to Alexander hit the shelves. In John White Alexander: An American Artist in the Gilded Age (2018), Goley mentions the painting in question and confirms a spring 1901 date of completion.4 However, the portrait is neither illustrated nor investigated in the concise biography. This Panorama contribution, therefore, presents object-based research that complements and suggests additional lines of inquiry to expand understanding of Miss Maude Adams, as “L’Aiglon” and related portraits of Adams executed by Alexander. Photographs located within the trove of documents that comprise Alexander’s papers establish the latest possible creation date, or terminus ante quem, for the portrait. The images (figs. 2, 3) show him posed in a well-appointed studio.5 Recent compositions are seen leaning against the walls and resting on easels. Within the same archival collection is a relevant news clipping. Alexander’s hometown daily the Pittsburg Bulletin printed one of the studio photographs on February 16, 1901. Underneath the image, a caption reads: “an interesting atelier and its occupant—Mr. John W. Alexander, and his new studio [on] East Sixty-Third Street, New York. 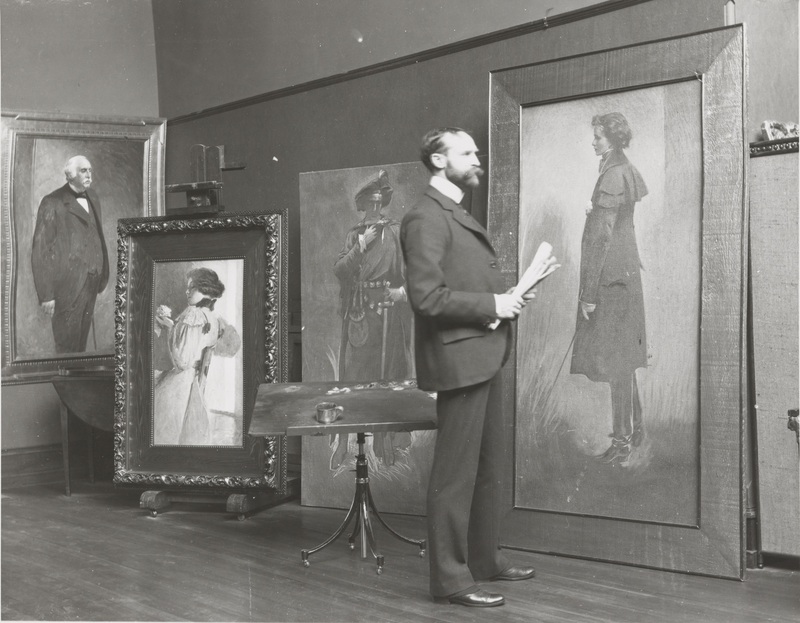 Portraits shown include that of Col. E. J. Allen, of this city, and of Miss Maude Adams, in ‘L’Aiglon.’”6 Indeed, the published photograph offers evidence that Alexander painted and framed—presumably in his new workspace—the portrait of Adams by the beginning of 1901. Recently, the museum examined Miss Maude Adams, as “L’Aiglon” with short-wave infrared imaging, which revealed the gestural brushwork visible in the photograph was later tamed. Alexander may also have reworked the lower portion of the canvas after this photograph of the studio was taken. Fig. 2. Photographer unknown, John White Alexander in his studio, New York City, c. 1900. Black and white print. John White Alexander Papers, Archives of American Art, Smithsonian Institution, Washington, DC. Fig. 3. 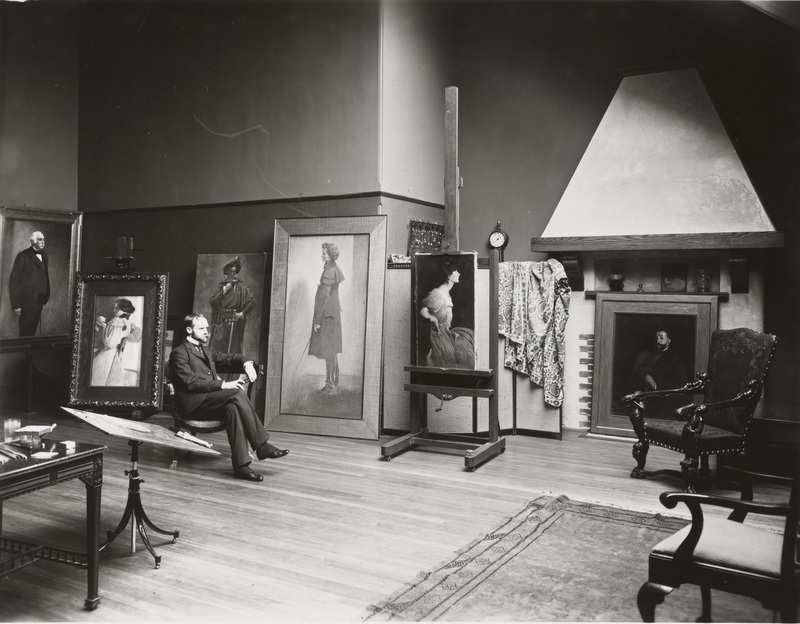 Photographer unknown, John White Alexander in his studio, New York City, c. 1900. Black and white print. John White Alexander Papers, Archives of American Art, Smithsonian Institution, Washington, DC. It is unlikely that Alexander shared these negative views on a female androgyne. However, we know the artist was familiar with the ideas of the French critic and their visual manifestations. Péladan organized the Salons de la Rose+Croix (1892–97), which featured works by artists aligned with the Rose+Croix order’s goals on topics such as gender and sexuality, and documentation proves that Alexander attended its inaugural exhibition.17 Although it is not the focus of the present article, Alexander’s Miss Maude Adams, as “L’Aiglon” merits further exploration through the lens of gender studies and the artist’s frame of reference during the period of its execution. Fig. 4. John White Alexander, Miss Maude Adams as “Peter Pan,” 1905. Oil on canvas, 70 1/2 x 36 3/4 in. State of Utah Alice Merrill Horne Art Collection, Salt Lake City. Now that this information has come to light, it is possible to draw an accurate timeline of the relationship between Alexander and Adams, as it relates to their collaborations on canvas. They made each other’s acquaintance upon Alexander’s October 1900 arrival in New York, where he would establish permanent residency after a decade of dividing his time between France and the United States. Alexander then painted Miss Maude Adams, as “L’Aiglon,” the first of at least three portraits.18 A prelude to their future partnership, the technique employed in Miss Maude Adams, as “L’Aiglon” relied on a support of thickly woven linen fabric (the “Alexander toile”), which absorbed the artist’s diluted pigment (à la Whistler) and produced a spatial effect they explored subsequently in the playhouse. The Alexander portraits fell into obscurity until their “rediscovery” by former Utah Museum of Fine Arts collections research curator Will South in the early 1990s.29 In 1996, South facilitated the purchase and transfer of Miss Maude Adams, as “L’Aiglon” to the Utah Museum of Fine Arts, where the oil would provide fertile ground for curatorial research two decades later. Positioning this portrait within the climate of its creation prompted new interdisciplinary interpretations within the reinstalled museum galleries. Cite this article: Leslie Anne Anderson, “Dating Miss Maude Adams, as “L’Aiglon,’” Panorama: Journal of the Association of Historians of American Art 4, no. 2 (Fall 2018), https://doi.org/10.24926/24716839.1664.